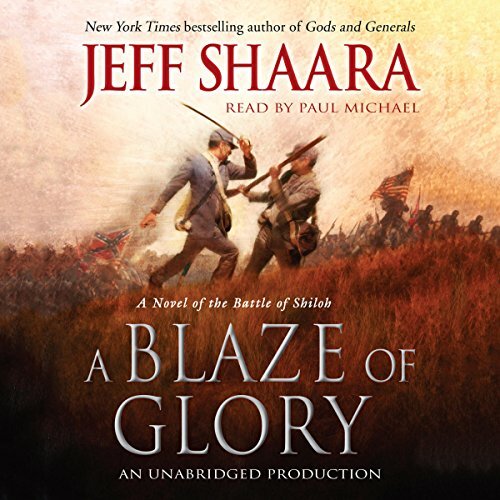 In the first novel of a spellbinding new trilogy, New York Times best-selling author Jeff Shaara returns to the Civil War terrain he knows best. A Blaze of Glory takes us to the action-packed Western Theater for a vivid re-creation of one of the war's bloodiest and most iconic engagements: the Battle of Shiloh. It's the spring of 1862. The Confederate Army in the West teeters on the brink of collapse following the catastrophic loss of Fort Donelson. Commanding general Albert Sidney Johnston is forced to pull up stakes, abandon the critical city of Nashville, and rally his troops in defense of the Memphis and Charleston Railroad. Hot on Johnston's trail are two of the Union's best generals: the relentless Ulysses Grant, fresh off his career-making victory at Fort Donelson, and Don Carlos Buell. If their combined forces can crush Johnston's army and capture the railroad, the war in the West likely will be over. There's just one problem: Johnston knows of the Union plans, and is poised to launch an audacious surprise attack on Grant's encampment - a small settlement in southwestern Tennessee anchored by a humble church named Shiloh. With stunning you-are-there immediacy, Shaara takes us inside the maelstrom of Shiloh as no novelist has before. Drawing on meticulous research, he dramatizes the key actions and decisions of the commanders on both sides: Johnston, Grant, Sherman, Beauregard, and the illustrious Colonel Nathan Bedford Forrest. Here too are the thoughts and voices of the junior officers, conscripts, and enlisted men who gave their all for the cause, among them Confederate cavalry lieutenant James Seeley and Private Fritz "Dutchie" Bauer of the 16th Wisconsin Regiment - brave participants in a pitched back-and-forth battle whose casualty count would far surpass anything the American public had yet seen in this war. By the end of the first day of fighting, as Grant's bedraggled forces regroup for could be their last stand, two major events - both totally unexpected - will turn the tide of the battle and perhaps the war itself. I have never been disappointed in a Shaara (either Jeff or Michael) book. This was slightly disappointing perhaps because of my expectation level. My first Shaara experience on Audible. Maybe this one would be as good as the many others I had read in print. The battles are more difficult to visualize with no maps at least for me. Would you listen to A Blaze of Glory again? Why? Yes, largely because I've listened to most of the author's books on more than one occasion. While fiction, it's very fact intensive and listening a second time tends to provide more insight into the story. As with all of the author's novels since "To the Last Man," at least a portion of the story is told from the perspective of someone serving on the front line. This, to me, makes these novels stronger even than his father's "Killer Angels" and the two follow ups written by Jeff. People that haven't served in war have no idea what the average soldier goes through on a daily basis while serving the front lines, so the perspective provided by Mr. Shaara is both real, fascinating and frightening all at once. Have you listened to any of Paul Michael’s other performances before? How does this one compare? I believe, but can't be certain, that he has read many of Mr. Shaara's novels. If I am correct they are all outstanding jobs. Who was the most memorable character of A Blaze of Glory and why? What three words best describe Paul Michael’s voice? The only thing that irritated me was that the narrator did not know how to pronounce Cairo (KAY-roh), which is not the city in Egypt. Jeff Shaara is one of my favorite authors. His writing is always consistent, well researched with a great story from beginning to end. This book was entertaining as well as informative. I look forward to reading (listening) to the next one in the series. Paul Michael did a great job with the narration as well. Absolutely. The excellent detail that the author brings to this story tends to overwhlem the mind. A second listening brings out new points and adds to the depth of this story. I intend to listen again. As a Civil War buff, I have walked and photographed the battleground at Shiloh. This story helps bring alive some details of the battlefield. It brings alive more of the characters and individuals that fought there and how they may have thought and felt during this horrific fight. While the dialogue that the author uses is of course fictional, that dialogue also makes the characters more realistic bringing out their flaws and their moments of heroism. Shiloh was a battle of emotions in both armies. And the author does an excellent job of revealing thoe emotions as well as showing how they changed over the course of the two-day battle. I learned many things that a dozen prior books did not reveal and I enjoyed that. General Albert Sidney Johnston. Johnston's basic character and attributes are discussed in other books. But the uthor really did an excellent job of attempting to reveal Johnston's handling of the battle and his interactions with the other Southern generals involved. His ability to navigate among the egos of the other generals helped illustrate his true excellence. Which character – as performed by Paul Michael – was your favorite? I enjoyed the author's attempts to reveal the thoughts and feelings of the privates that fought in te battle. So little is known and explained about what the average soldier experienced. An Opportunity Lost; A Disaster Averted. Paul Michael does a fine job of narrating this book. His performance separates the characters well. I also enjoyed that he doesn't overdue the fake Southern drawl that so many other narrators attempt in other books. In a book describing such extreme emotion on both sides, a calming and strong narration makes for an excellent contrast. Well done Paul. Where does A Blaze of Glory rank among all the audiobooks you’ve listened to so far? In keeping with the family writing very informative. Good explanation and superb write up in the epilogue about the participants in the leadership of both sides. Another classic by Jeff Shaara!!! I really enjoyed this one! Definitely a civil war classic by Jeff Shaara in my opinion! Mit Spannung habe ich das erste Buch der neuen Civil War Triologie von Jeff Shaara erwartet und nun angehört. Shaara nun in die Schlacht von Shilo 1862. Das Schlachtfeld wird vor dem geistigen Auge sichtbar da es Shaara wie kein anderer versteht die Geschehnisse aus Sicht der Soldaten und Beteiligten zu erzählen und nicht versucht reine Fakten abzuspielen. In manchen Szenen fühlt man sich, als ob man direkt neben Stonewall Jackson steht wenn er den Angriff befiehlt bzw. seine Truppen vorwärtspeitscht. Auch der Sprecher macht seine Arbeit ausgezeichnet. Er spricht ein sehr gut verständliches Englisch so das man eigentlich mit durchschnittlichen Englischkenntnissen keine Probleme haben sollten. Für jeden Bürgerkriegsinteressierten kann ich nur sagen: Unbdingt anhören ! !